We’d love your help. 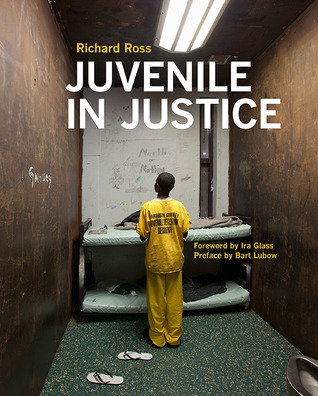 Let us know what’s wrong with this preview of Juvenile In Justice by Richard Ross. Winner of the 2012 Best News and Documentary Photography Award from the American Society of Magazine Editors for a selection published in Harper’s Magazine, the photographs in Juvenile in Justice open our eyes to the world of the incarceration of American youth. The nearly 150 images in this book were made over 5 years of visiting more than 1,000 youth confined in more tha Winner of the 2012 Best News and Documentary Photography Award from the American Society of Magazine Editors for a selection published in Harper’s Magazine, the photographs in Juvenile in Justice open our eyes to the world of the incarceration of American youth. The nearly 150 images in this book were made over 5 years of visiting more than 1,000 youth confined in more than 200 juvenile detention institutions in 31 states. These riveting photographs, accompanied by the life stories that these young people in custody shared with Ross, give voice to imprisoned children from families that have no resources in communities that have no power. To ask other readers questions about Juvenile In Justice, please sign up. Powerful. Only takes an hour to read, but if you're looking for a new career path, this may decide it for you. I may not know how to keep kids out if these institutions, but I've got a better idea than the federal government on how to keep them from returning. Any thinking person does. So why do we allow this to continue? We have to change the prison economy if we want to change the prison system. "Research shows that youth confined for longer periods of correctional confinement are no less like Powerful. Only takes an hour to read, but if you're looking for a new career path, this may decide it for you. I may not know how to keep kids out if these institutions, but I've got a better idea than the federal government on how to keep them from returning. Any thinking person does. So why do we allow this to continue? We have to change the prison economy if we want to change the prison system. "Research shows that youth confined for longer periods of correctional confinement are no less likely to reoffend than youth confined for shorter periods." "On any given day, approximately 70,000 young people are in juvenile detention or correctional facilities each night." "The cost for a typical stay in a juvenile detention facility is $66,000 to $88,000 to incarcerate a young person for 9 to 12 months." "The state of California spends $224,712 annually to house a juvenile in the new "green" Oakland facility. Oakland spent $4,945 on the education of a child in the Oakland public school system." "Except in cases where juvenile offenders pose a clear and present danger to society, removing troubled young people from their homes is expensive and often unnecessary -- with results no better (and often far worse) on average than community-based supervision and treatment." I wanted this book because of the photography, but I ended up more interested in the text. Juvenile correction statistics are shocking and individuals' stories even more so. As a society we should be paying more attention, not to mention improving our system. I thought in a few instances the author used statistics inappropriately (compared apples and oranges) to sensationalize. I'm not sure if this was deliberate or out of ignorance, but either way it didn't seem necessary to me; the reality was I wanted this book because of the photography, but I ended up more interested in the text. Juvenile correction statistics are shocking and individuals' stories even more so. As a society we should be paying more attention, not to mention improving our system. I thought in a few instances the author used statistics inappropriately (compared apples and oranges) to sensationalize. I'm not sure if this was deliberate or out of ignorance, but either way it didn't seem necessary to me; the reality was awful enough. Also, I didn't particularly care for the assumptions he made in some of the acknowledgements regarding the institutions. The author credits individual institutions as being open and welcoming to him - which he says showed that they cared more for the condition of their inmates. While others, who were less welcoming, were trying to protect the institution itself. Maybe, but I think that's a very dangerous assumption to make - especially as a journalist. It made me more aware of his bias instead. And excellent pictorial view of juvenile detention centers and those incarcerated there. This will be a controversial book, no doubt. I'm going to be a fence sitter on my views, because the topic of this book is based on politics. I will say there were some stories of kids who didn't belong there at all and those that did. As with all inmates, most of the narratives didn't show any responsibility, but these narratives are unique in that the reader MUST put into perspective human development and And excellent pictorial view of juvenile detention centers and those incarcerated there. This will be a controversial book, no doubt. I'm going to be a fence sitter on my views, because the topic of this book is based on politics. I will say there were some stories of kids who didn't belong there at all and those that did. As with all inmates, most of the narratives didn't show any responsibility, but these narratives are unique in that the reader MUST put into perspective human development and teenagers. They are self-centered, they know it all, they think of themselves and mature and adult....but they still need protection, comfort, and the need to learn. They're in limbo, as this book so well portrays. Wow. This book is amazing. Ross spent years visiting various juvenile detention facilities throughout the United States, and his photographs and snippets of interviews with inmates are interspersed with statistics regarding incarceration of juveniles. It's sad. Once kids are in the system, they're pretty much stuck there. There's very little rehabilitation. According to this book, people as young as 11 have been sentenced to life without parole - 11! To all my Bloomington peeps: this book is now Wow. This book is amazing. Ross spent years visiting various juvenile detention facilities throughout the United States, and his photographs and snippets of interviews with inmates are interspersed with statistics regarding incarceration of juveniles. It's sad. Once kids are in the system, they're pretty much stuck there. There's very little rehabilitation. According to this book, people as young as 11 have been sentenced to life without parole - 11! Powerful. Everyone needs to see this/read this. Juvenile In Justice is a book on a mission. Author and photographer Richard Ross seeks to open our eyes to the stories behind the walls of juvenile justice facilities throughout the U.S.
Each photograph of a child in a detention facility is accompanied by a paragraph about that child, often told from their own point of view. The photographs are from many different facilities, but these facilities are strikingly similar, as Ross points up in several multi-tile displays where the commonalities of Juvenile In Justice is a book on a mission. Author and photographer Richard Ross seeks to open our eyes to the stories behind the walls of juvenile justice facilities throughout the U.S.
Each photograph of a child in a detention facility is accompanied by a paragraph about that child, often told from their own point of view. The photographs are from many different facilities, but these facilities are strikingly similar, as Ross points up in several multi-tile displays where the commonalities of juvenile detention centers are made plain. But it's the children that stay with you. Because they are all minors, there are very few true faces to help tell their stories. We see blurs or smudges where childish faces otherwise would reside. When an eye or mouth is in focus, it is the only portion of that child's face that we see. Their entire humanity reduced to a single, long-lashed, large-pupiled eye, surrounded by bruises. A corner of mouth, turned down in an expression of sadness and suffering that is greater than many adults will ever experience. Many may find it surprising that this title is not a denouncement of the juvenile justice system. Often, the words that accompany the photos convey a system full of people trying to do the right thing. The takeaway is that the system is broken, and that society (including the parents of many of these children) has failed them in a profound, heart wrenching, and permanent way. There is no way around it - this book is disturbing. It may be very upsetting to younger readers. There is no cursing beyond two instances of the "F" word (one a tattoo described by a youth, the other a scar carved into the arm of a 16 year old). The youngest child discussed in this work as having interacted with the juvenile justice system was only 6 years old. Most of the youth in these pages are 13-17. I believe this book is appropriate for ages 13 and up, with 9 - 12 year olds also being a possible audience, given either a maturity beyond their years, or a circumstantial interest in the subject matter, due to their own life experiences. It's a collection of photographs illustrating what it means to be incarcerated in a juvenile facility. No faces are shown, but he photos picture the teens and, in some cases, children, who are locked up and are, supposedly, being rehabilitated, but who are frequently just beginning a lon This book was an impulse read. I saw a review for it posted on Sarah Reads Too Much and thought it sounded like an interesting book. Luckily, I was able to pick up a copy at the local library to check out myself. This review has been hidden because it contains spoilers. To view it, click here. Richard Ross photographed incarcerated youths in various facilities across the country (more than 1000, in more than 200 ‘detention institutes’ in 31 states). Since most are/were minors, the photos do not show recognizable faces – they are incomplete, obscured, hidden, etc. Youth interviewed for the project were asked about the circumstances surrounding their incarceration, how long they had been there, who – if anyone – visited them, when they could expect to leave. Although some had very viole Richard Ross photographed incarcerated youths in various facilities across the country (more than 1000, in more than 200 ‘detention institutes’ in 31 states). Since most are/were minors, the photos do not show recognizable faces – they are incomplete, obscured, hidden, etc. Youth interviewed for the project were asked about the circumstances surrounding their incarceration, how long they had been there, who – if anyone – visited them, when they could expect to leave. Although some had very violent lives/experiences, most seemed to be there because they’d made some poor choices/mistakes and didn’t have a good environment to return to (or, in some cases because their families didn’t want them). Very sad. The cells/living quarters appear frightening and dehumanizing, and studies indicate that locking children up in this kind of environment doesn’t really do much in terms of rehabilitating them (so they don’t reoffend). Although there are some photos of kids doing activities (exercise bike, playing chess/violin), Ross doesn’t really get into what kinds of programs/activities/education these kids receive once they are in the detention centers (and among these facilities some are better than others). I am curious about what other options exist for youth like this who have done bad (and sometimes terrible) things. What a powerful, important book. Having read it, I'm very happy it won an Alex Award last year. Richard Ross's photographs of teens in juvenile detention centers and of the centers th What a powerful, important book. Having read it, I'm very happy it won an Alex Award last year. Richard Ross's photographs of teens in juvenile detention centers and of the centers themselves are very powerful, as are the brief statements collected from teens and the few carefully chosen statistics/quotes that are pulled out onto blank text pages between the photos. "'What percentage of girls have been sexually abused when they come here?' 'What percentage? Every one. All 88 girls in our custody.'" "Black youth are 9 times as likely to be sentenced to adult prisons as white youth." "Children as young as 11 have been sentenced to life without the possibility of parole." Heartbreaking, illuminating and beyond important look at a slice of our society that seems entirely foreign to most, but ignored by many who are aware of it. Deeply personal to me. An expanded look at what many families such as my own have had a small glimpse into, but could never fully understand. My older brother's adolescence mirrored so many of the accounts documented in this work. Behavior and mental problems that escalated as he got older eventually turning into stays at juvenile facilitie Heartbreaking, illuminating and beyond important look at a slice of our society that seems entirely foreign to most, but ignored by many who are aware of it. Deeply personal to me. An expanded look at what many families such as my own have had a small glimpse into, but could never fully understand. My older brother's adolescence mirrored so many of the accounts documented in this work. Behavior and mental problems that escalated as he got older eventually turning into stays at juvenile facilities across the midwest. Sometimes charged, sometimes not; but always with the supposition that it was the answer. With hindsight now at our disposal, it obvious that it wasn't for the right course of action and may have caused more harm than good. His life isn't a miracle story of triumph over his trouble, he will always struggle not only with his own psyche but with his lack of socialization that comes from so much of his formative years spent locked up. I was not shocked by anything I saw or read here, really, but I was moved even still by the photos and the stories. Both are bleak, and that's the point. The statistics, statements, and photographic evidence are all pretty damning and really point to the counterproductive, classist, and racist nature of our juvenile justice system. The photos themselves are masterful in achieving emotional impact and artfully curated. I just wish there was a way to both portray the lack of power these young peopl I was not shocked by anything I saw or read here, really, but I was moved even still by the photos and the stories. Both are bleak, and that's the point. The statistics, statements, and photographic evidence are all pretty damning and really point to the counterproductive, classist, and racist nature of our juvenile justice system. The photos themselves are masterful in achieving emotional impact and artfully curated. There are more photographs than text in this book. The photographs are of Juvenile detention centers across the US as well as inmates with their faces blurred or physically covered/blocked by the subjects since all of them are minors. Each photograph has a caption. The caption of the kids explains in their own words why they are in the system. "Nearly 3 of every 4 youth confined in a residential facility for delinquency are n There are more photographs than text in this book. The photographs are of Juvenile detention centers across the US as well as inmates with their faces blurred or physically covered/blocked by the subjects since all of them are minors. Each photograph has a caption. The caption of the kids explains in their own words why they are in the system. "Nearly 3 of every 4 youth confined in a residential facility for delinquency are not in for a serious violent felony crime." "America's heavy reliance on juvenile incarceration is unique among the world's developed nations." This is an amazing resource. Really well done photographs, great layout, lots of statistics and data presented accessibly. Also, really hard to read. You should pair it with No Choirboy for a period of reading really good and simultaneously awful information about juvenile justice. This floored me: "...it costs, on average, $88000 per year to incarcerate a single youth in a juvenile correctional facility. By comparison, a four-year public university costs less than $8000 a year." That cost is a little out of date, but you could go to college full time and live on campus for four years for $88000! What a lot of money we waste housing kids in prison for minor infractions when we could be educating them instead. Another book from the 2013 Quick Picks for Reluctant Young Adult Readers. Incredible compilation of photos from inside juvenile prisons, combined with stark facts about juvenile detention and selections from the 1000+ interviews conducted by the author. Must-read for anyone looking to get informed about e.g. efforts to build new juvenile detention centers. Warning: may turn you into a prison abolitionist. It's a book about cages for children, after all. Wow. This is an incredibly powerful photo project about youth incarceration in the United States. It explores the situations that cause these young people to make the decisions they do. It questions whether incarceration of children and teens is really the way to create a safer society. It shares the stories of some of the most vulnerable populations. Reading this book was both heartbreaking and necessary. Juvenile in Justice is a collection of photographs accompanied by very short, first-person stories of life in a juvenile jail or correctional center. Richard Ross traveled around the country, visiting different juvenile centers across the United States. The pictures, which do not show any of the children’s faces, paint a haunting picture of the places they must reside in. Their short stories are extremely impactful, allowing the reader to step into their shoes for a brief moment in time. This book offers a haunting look at the juvenile justice system and its many shortcomings. The author makes readily apparent the need for therapeutic care, not only corrective measures, as the vast majority of juvenile offenders have been victims of severe abuse, neglect, drug addiction, and mental illness. The stark images and layout add to the power of the author's purpose. The images in this book stay with you. The descriptions of prison life for teens and children in their own worlds, the disturbing statistics, the comments of corrections officers and administrators, all emphasize what the pictures of these anonymous children display: a system that is broken, despite people's best intentions. This was a great insight into life in juvenile prisons in the U.S. I won't say it was easy to read (or see) by any means, but I think it was well worth my time to get an idea of what some of our nation's children are dealing with. This book is amazing. I'm going to have to reread this. The photos tell more of a story than the text. All ages and races and levels of confinement are represented here. You can tell that this is a labor of love. Anyone who works with teens should pick this up. This review has been hidden because it contains spoilers. To view it, click here. The statistics in here are crazy. I feel like I know most of the kids in this book. I think that everyone who works with youth should read this book as a reminder for why we got involved in working with you. A profound YES! A very chilling look inside the American juvenile justice system. Also a very quick read, full of photos with brief blurbs about the subjects of the photos, identified by initials, age, and place of incarceration. An amazing, informative, sad read. Humanizes prisoners and brings light onto the circumstances that led to their incarceration. Makes me feel like defending these teens from their own lives in so many ways. Since this is self-published, I am not able to find it in either library system I belong to nor is either library system willing to buy it (I asked. It looks great, but I'm not sure I'll ever know without buying it and I'm not sure I want to own it. A sad, but illuminating portrayal of the juvenile justice system. This books make you think and consider just what our current system is actually achieving. Sobering and powerful, these images were often very difficult to look at. Social commentary at its thought-provoking, heart-breaking, critical best.